Ok, I totally fell in love with this tree! You can find it HERE. I love the little baubles on the end of the branches and they look like ornaments, as I was coloring this I realized it could be for any reason, season or color. How cute would it be in pinks and purples, it could be for a girl or a boy, it could be done in manly colors, fall colors, spring, summer, you get the idea and it would be perfect with almost any sentiment. SKdigis Challenge Blog will be taking a break but please stop by to check out our latest projects and find some inspiration along the way! Adorable!!! I loveeeeeeeee that tree and the snowflakes!!!! such a fun tree and love the idea of using it for so many other seasons!! What an adorable xmas card! Your coloring is great. Thank you for sharing it with us at MIM. Thanks for letting me know about the extra challenge! I've entered! This image is very versatile & that makes it fun!! Hope all is well in your neck of the woods!!! I've been buried.... Heellllooooooooooooo -- Anybody up there...???!!! Tee hee!! Enjoy the weekend !!! Beautiful Sharla , Thanks for playing along this time at OLL. 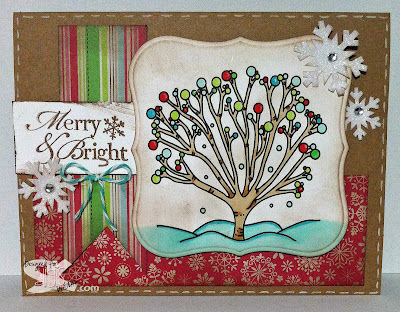 This is indeed a tree for life: Thank you for joining in at Crafty Hazelnuts Extra this month. Hugs Mrs A. (GDT).